Review the ASA-100 Quality System Standard and AC 00-56. Perform a self-evaluation audit of your quality system using ASA-100 as the basis for the audit. A suggestion is to use the ASA-100 Self-Audit Checklist for documenting the audit. Complete ASAAP application and an ASA Staff member will contact you to coordinate your payment and audit timeline. Upon receipt of the completed application and payment, ASA will contact you to arrange the date of your audit. Prior to the audit, ASA must have a controlled copy of your quality manual and the distributor must have completed the self-evaluation audit. ASA has a Quality Manual Template for sale if you need assistance with creating or updating your Quality Manual to meet the requirements of ASA-100. Please contact ASA for more information. ASA conducts the audit at your facility. The audit is typically conducted by one auditor and takes one day to conduct. Upon completion of the physical audit, the auditor will leave with the auditee any corrective action associated with the audit. While not common, there may be no corrective action. The auditee will be allowed time to complete the corrective action. Upon successful completion of the corrective action, ASA will provide the distributor with a certificate and certifying letter that supports the requirements of FAA AC 00-56. ASA will also provide the distributor with a logo license agreement. Accreditation to FAA AC 00-56 does NOT become effective until your company is listed in the Voluntary Industry Distributor Accreditation Program database. The Aviation Suppliers Association has been designated by the FAA as the database manager. To become listed in this database, you must forward a copy of the accreditation certificate and a database letter to ASA. The database letter asserts that your company will continue to comply with AC 00-56 (Complete details can be found in AC 00-56 page 9, Para. 10). Click here for a copy of a sample database letter. 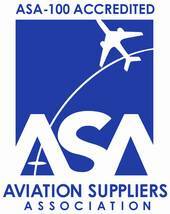 For addtional questions about the ASA Accreditation Program, please email accreditation@aviationsuppliers.org.